American Cannabis Company Inc (OTCMKTS:AMMJ) investors have reason to be excited given the recent surge in the share price. The stock has advanced over 70% since the beginning of the month and almost 30% on Monday. Volume hit a 2 year high with over 2.9 million shares trading hands which was over 48 times its daily average of 0.06 million shares. The stock closed the day at $0.179. Over the last several months, AMMJ has had a string of new developments, announcements, and contracts. Just recently, it announced that TGIG, has initiated cultivation and processing operations at its production facility, and opened its first dispensary. The second dispensary for The Grove, located just minutes from McCarran Airport and the Las Vegas Strip, is slated for an April grand opening. AMMJ has announced several purchase orders and recently. In January it sold over $50k of its So-Hum Living Soil(TM) is a proprietary “just add water” growing medium that contains 100% bio-dynamic ingredients. In a separate announcement, three separate clients ordered a total of $227k in products for cultivation equipment. Lastly and most recently, the company had received an additional order from to separate clients totaling over $30k for more of its So-Hum Living Soil(TM) is a proprietary “just add water” growing medium that contains 100% bio-dynamic ingredients. American Cannabis Company Inc (OTCMKTS:AMMJ) and its subsidiary company, Hollister & Blacksmith, Inc., doing business as American Cannabis Consulting are based in Denver, Colorado and operate a fully-integrated business model that features end-to-end solutions for businesses operating in the regulated cannabis industry in states and countries where cannabis is regulated and/or has been de-criminalized for medical use and/or legalized for recreational use. It provides advisory and consulting services specific to this industry, design industry-specific products and facilities, and manage a strategic group partnership that offers both exclusive and non-exclusive customer products commonly used in the industry. 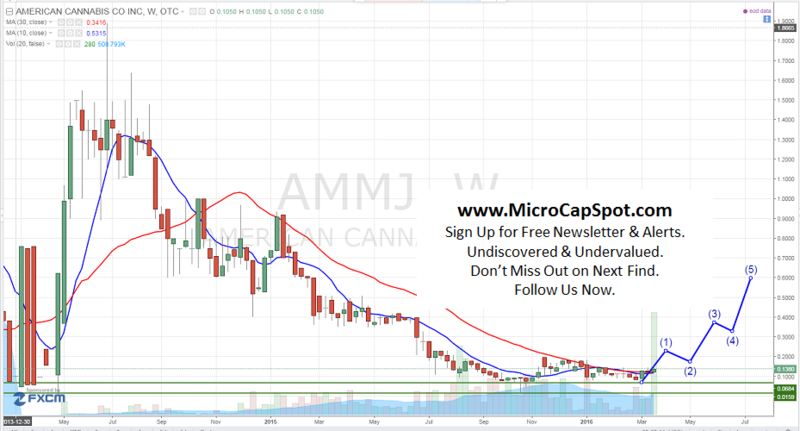 We will be updating on AMMJ when more details emerge so make sure you are subscribed to Microcapspot so you know what’s going on with AMMJ. Disclosure: we hold no position in AMMJ either long or short at the publication of this article and we have not been compensated for this article.